1473a, CENTER CAP USED, 86-91, FORD, TAURUS, PAINTED SILVER, CHROME OUTER RING, BLUE FORD OVAL, CHROME WORD FORD, SNAP IN TYPE, 6-1/8" DIA. 1473a, CENTER CAP USED, 86-91, FORD, TAURUS, PAINTED SILVER, CHROME OUTER RING, BLUE FORD OVAL WITH CHROME WORD FORD, SNAP IN TYPE, 6-1/8" DIA. 2055a, CENTER CAP, 95-97, DODGE, AVENGER, PAINTED SILVER, 5 PLASTIC CLIPS & WIRE RING, 6-1/2" DIA. 2055a, CENTER CAP USED, 95-97, DODGE, AVENGER, PAINTED SILVER, WITH 5 PLASTIC CLIPS & WIRE RING, 6-1/2" DIA, A=SILVER B=WHITE. 2065a, Used Rims, 16X7, 5 LUG, 4-1/2", 96-97, CHRYSLER, LHS, CONCORD, NEW YORKER, PAINTED SILVER, CAMELOT, ALLOY. 2065a, Used Rims, 16X7, 5 LUG, 4-1/2", 96-97, CHRYSLER, LHS, CONCORD, NEW YORKER, PAINTED SILVER, CAMELOT, ALLOY. A=SILVER B=GOLD. 2126, Used Rims, 17x8, 5 LUG, 5-1/2", 00-01, Dodge, 1500, SILVER PAINTED, 5 SPOKE, ALLOY. 2165, Used Rims, 17x8, 5 LUG, 5-1/2", 02-03, DODGE, 1500 PICKUP, PAINTED SILVER 5 SPOKE ALUM. 2228, CENTER CAP USED, 04-06, CHRYSLER, SEBRING, PAINTED SILVER, RAISED CHRYSLER EMBLEM, PLASTIC CLIPS & WIRE RING, 2" DIA. 2246b, Used Rims, 17X7, 5 LUG, 4-1/2", 05-07, DODGE, CHARGER, MAGNUM, SILVER PAINTED, 5 SPOKE, ALLOY. 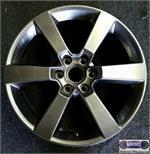 2334A, USED RIM, 16X6-1/2, 5 LUG, 127MM, 06-13, DODGE, GRAND CARAVAN CREW, PAINTED SILVER, 5 SPOKE, ALUM, B=POLISHED.